Elsewhere in Euro 2020 qualifying today, Hungary upset Croatia in Group E, while Scotland underwhelmed in beating San Marino. Daniel James scored the only goal as Wales beat Slovakia, while Germany struck late to beat the Dutch in Amsterdam. Eden Hazard and Michi Batshuayi scored as Belgium shrugged aside Cyprus. England are away to Montengro tomorrow in the next round of fixtures. See you there. Northern Ireland's Jonny Evans speaking to Sky Sports: "Their goal knocked us a bit because we know how hard it is to score, but we kept going. It probably wasn't our best performance, but we got our reward. We wanted the six points, we have tough fixtures coming but we can't ask for any more." 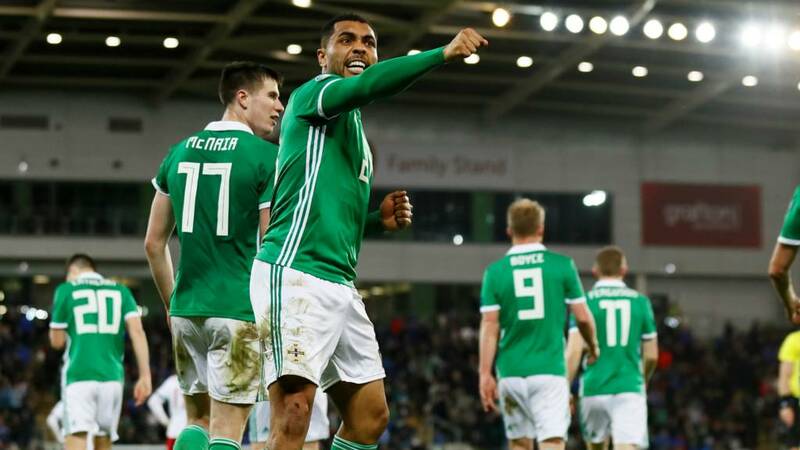 Northern Ireland's Josh Magennis speaking to Sky Sports: "The rest of the lads had done the job, I was just blessed to be the one to come on and score. That is what Michael O'Neill asks of his substitute to come on and try and make a difference. We are a team that finds a way of winning. Where does that leave Group C you ask? Well, Northern Ireland are topping off the standings like a toupee. Cue Sweet Caroline on the Windsor Park tannoy. A massive stop from Bailey Peacock-Farrell! The Northern Ireland goalkeeper spreads himself to block a point-blank shot at the back stick. Precision Germany stereotypes come true to surely win it! A lovely incisive pass from Ilkay Gundogan frees Marco Reus who in turn serves it up on a platter for Nico Schulz. The Hoffenheim man measures his side-foot finish to perfection. A big win in the post for under-pressure Joachim Low. Michael O'Neill grips a fist and thumps thin air on the sidelines! It is a superb goal as well. Josh Magennis brings down Craig Cathcart's long ball forward, spreads the ball wide, Stuart Dallas slips in Paddy McNair down the right edge of the box. His low centre is perfect and Magennis is on the spot to turn in! Pavel Nekhaychik comes on for Belarus. Paddy McNair whips in a cross, Kyle Lafferty is lurking with intent, but a defender's head gets it away. Do Northern Ireland go all out, every man pushed up, even this early in the campaign? Or do they need some caution to protect a point? Belarus can pass the ball about nicely and might find space on the break. Robert Lewandowski to the rescue. Poland were toiling in vain against the less-the-mighty Latvia, ranked 131st in the world. But the Bayern Munich man has found the net to spare the hosts' blushes. Michael O'Neill is stalking impatiently on the sidelines. Time is ticking away. Fifteen minutes to find a goal and the victory that he has earmarked as vital to Northern Ireland's hopes of getting out of this group. Josh Magennis unleashes his trebuchet long throw-in, slinging the ball into the penalty area. It causes chaos, but Kyle Lafferty cannot exploit it to the full, hooking his volley just over the top. Michael O'Neill changes it up. Off comes Niall McGinn and on comes striker Josh Magennis as the hosts push for a winner. Northern Ireland are asking the question...nothing doing after Kyle Lafferty's full-blooded shot thuds into Mikhail Shivakov though. And the Dutch have doubled up. Memphis Depay threads a near-post finish past Manuel Neuer after digging the ball out of his feet in the midst of a penalty-box scramble.